MS Craft Fair Wednesday is the new Black Friday. Doors opened at 1 PM in Ramsing for the annual shop-stravaganza, and a scant 20 minutes later bath bombs, truly cute snow globes, and all manner of stocking stuffers were sold out. Clearly, the Group V maker-vendors knew their market: Displays were adorable, packaging was clever, and the selling was fierce. Parents, teachers, and students alike stumbled out of the gymnasium arms full, wallets lighter. 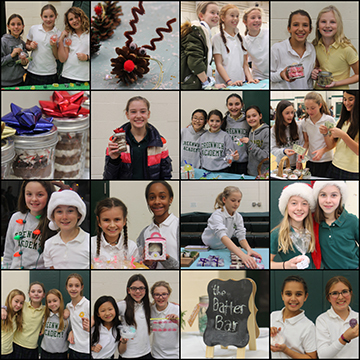 Hot items included spa supplies, jewelry, and comestible kits of cookies and hot cocoa. Stress balls, always a strong mover at the fair, did not disappoint. Going on for longer than any of the participants have been alive, the MS Craft Fair comprises lessons in business and marketing, economics, sociology, entrepreneurship, behavioral science, and old-fashioned sales. Mentored by teachers Marianna Di Meo and Stella Dean, the girls also take advantage of parent angel investors, who often do double duty as interns come the late-weekend push to meet production deadlines. This year, the competition was intense with more than just the bottom line at stake: Proceeds go to the Upper School Sponsor the Future club for donation to Children International and organizations assisting those affected by the California wildfires. Which is, of course, the best lesson, that you can move merch and hearts at the same time. See more images from the MS Craft Fair.